This is my second time participating in Lori Anderson’s party. You can follow Lori and all the happenings at the 7thBead Soup Blog Party by visiting her website at http://lorianderson-beadsoupblogparty.blogspot.com/. 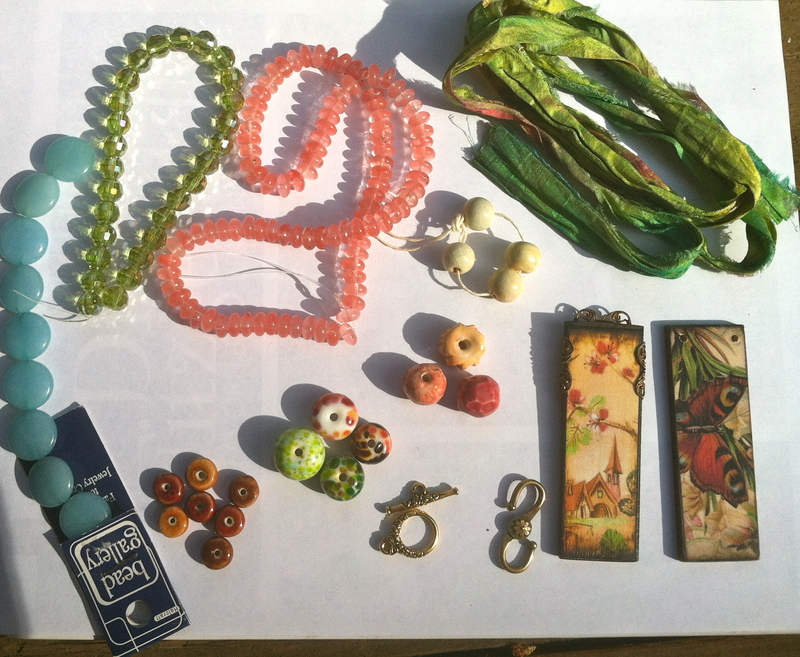 My Bead Soup Party partner was Kari Asbury of Hippie Chick Design. Here is my post about her gorgeous work, including information about what she sent me. Click on this link to be taken to her Etsy shop to see more of her creations and on this link for her blog. Kari sent me a gorgeous soup including two ephemera pendants she made herself. I made two necklaces using each pendant as the focal. I started out by making a few lampwork beads to match colors of the butterfly pendant. This necklace took me many hours because I tried to go out of my comfort zone and use wire work and chain to make an asymmetrical piece. I could not get it right and, after many changes, it became symmetrical. I’m happy with the necklace and plan to wear it often. 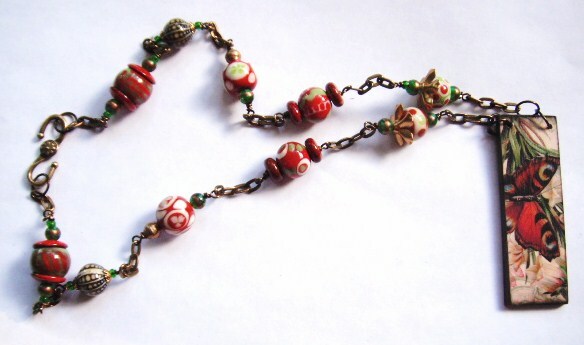 I used brass chain, lampwork beads, “mood” beads, clay beads from Kari, glass beads, and the beautiful brass clasp from Kari. I used the sari silk from Kari along with chain and charms for the other necklace. I had never used sari silk before and am happy with the result. There is also a Pinterest board for the jewelry in the party. You made two very beautiful necklaces!!! So different color choices, but both really particular! ery well done! 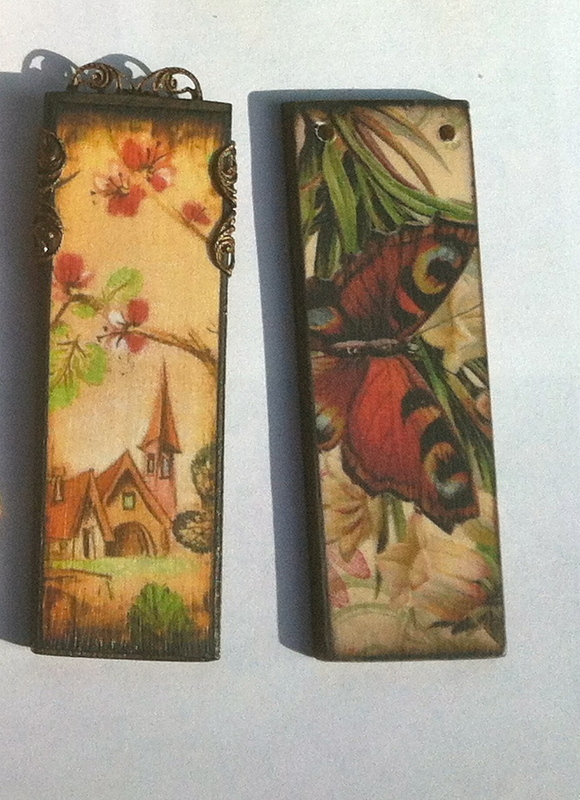 Wonderful pieces, I really like the second one, the silk ribbon really adds to the colors. Both pieces are gorgeous! The lampwork beads in the 1st were MEANT for that piece and the sari silk is perfect for the design in the 2nd. I really love both. So gorgeous, Inge… those pendants were a true inspiration! Beautiful necklaces! Your bead soup was great and you did a great job with it. I also received sari silk from my partner, it was the first time I used it too. I love sari silk now! Fabulous – really like the second necklace in particular! OMGoodness…I ADORE both of these necklaces! I would be sooooo proud to wear them, they are stunning! GREAT Soup girl, it’s simply YUMMMMY! I love both necklaces. The sari silk added great color and texture to the second necklace. Great design, A love them both! your pieces are so lovely! In particular I like the green one with the silk and chain. wonderful pieces, I love your style! thanks for the inspiration! 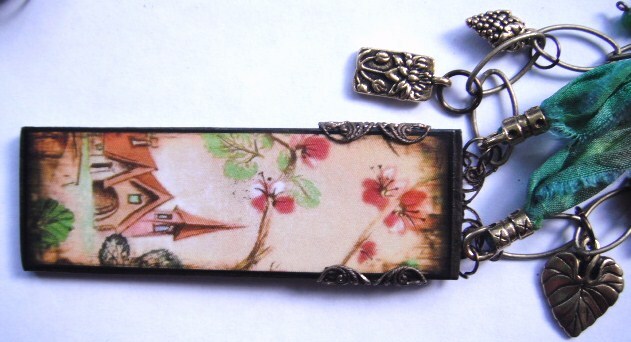 Those two ephemera pendants are wonderful and the pieces you created from them are fabulous. Love them! I love the softness of the ephemera pendants your partner made, and you complimented them perfectly with your work. Your necklaces are so beautiful, springy, delicate but with charachter. Love your work very much. Lovely work. I especially like the green necklace. Great job. so so beautiful, absolutely love both. Great designs. Really lovely pieces – especially the second necklace – just fab! Beautiful designs – love the red, brass and sari silk! I love both of your necklaces! Delicate, feminine and original….well done! Your designs suit those focals extraordinarily well! I love the texture, theme, and colors of both! Outstanding work! You received gorgeous materials, and made them justice – absolutely delicious! Both pieces turned out very nice. I really like the colors and the beads in the first piece. It’s probably my favorite. Nice job. Very charming, Inge. 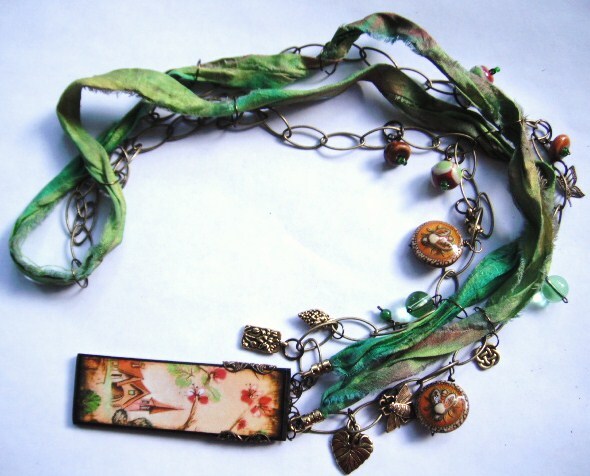 I love the romantic, vintage look of both necklaces – my personal favourite is the second one with the sari silk ribbon. Very well done! Both of your necklaces are beautiful. Good job using your soup. Kudos for adding the silk which was new to you. Both of your necklaces are fabulous! I love how you brought out the red in that one focal piece. How cool that you made your own beads to go with it. Both pieces are really lovely. I just love what you added…especially those cool bee’s. Great job! Perfect composition on both necklaces. I love that they are so different and yet the way you’ve put them together compliments those beautiful pendants perfectly. You made two fantastic necklaces with your soup. Stunning pieces! Inge, I’m still blog hopping the Bead Soup while also blog hopping the earring swap. You made some great pieces! Those pendants are beautiful & unique. I love the way you highlighted them in your necklaces.